McKay has given us another extremely encouraging day. We walked in this morning and Mr. Independent was in the middle of a spontaneous ventilator test and doing well. I was so excited I started to cry. 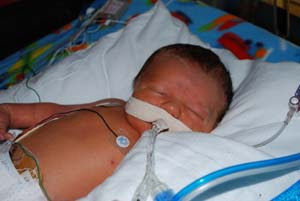 Basically that means they had turned off McKay's ventilator support for a short trial to see if he could hold his own. He did beautifully. Immediately following the test they sent a blood sample to test for gas levels in the blood that indicate whether or not the exchange of O2 and CO2 and other chemicals in the blood show that McKay is not only breathing, but doing so efficiently enough to exchange gases and such in his system. Unfortunately McKay's pH was a bit too low (just .01 low!) and his pCO2 levels were slightly high. So they gave him a few hours to rest and repeated the test later on in the afternoon. Although he breathed beautifully on his own through the test, the blood test results came back nearly identical to the morning results. 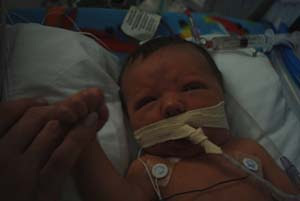 At that point the Intensivist said McKay would not come off the ventilator today, but they would retest him sometime during the night tonight and again in the morning and if the blood gas tests came back the same, they may reconsider what "normal" levels mean for McKay. All in all if he continues to perform as consistently as he did today, they will most likely move forward with taking out the ventilator. Although it was a little disappointing not to see that ugly tube removed today, I am glad the docs are letting McKay call the shots. When he's ready, he's ready. The worse thing we could do at this point is rush him along. He did have his chest tube and catheter removed today, opened his eyes again for a about 30 minutes and visited with his bros again. It was wonderful to see him look around and connect. Every day there are fewer tubes and more baby to look at...now if we can get him off the ventilator tomorrow we will get our first chance to see his face, free and clear. I can't wait. I have to keep reminding myself that he just four days old...just four days! My sweet boy has performed like an absolute rock star through all we've asked him to do at this point and I feel very confident he will continue to improve each day. He has gone through more than many of us will have to endure in a lifetime. My only comfort about that reality comes when I realize that without this experience we would most likely be saying goodbye to our sweet boy instead of looking forward to the beginning of a lifetime together. I truly believe he is a remarkable spirit who has made great sacrifices to come to this life and teach others about courage, priorities, and love. At least those are the lessons he has started with me. Wow! He is such an amazing little guy! You are in our thoughts and prayers, always! Mindi he sounds like he is doing so great! 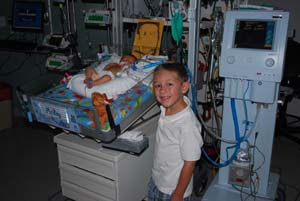 We hope that his ventilator comes out today! We will keep our fingers crossed for you! 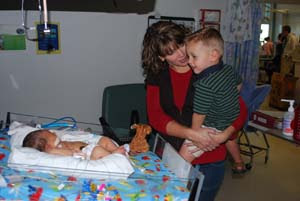 What a strong little man, and what a wonderful mom he has! I was going to say exactly what Lisanne said. You are all rock stars in my opinion. I hope you guys have a great day. He is such a cute baby. I love the pics of your big boys looking at him. So precious. Mindi, I have been sharing your blog with my mom and this is what she responded with today. I had to share it with you. Love ya!